Sometimes a picture says more than a thousand words, but in this case the picture above doesn’t completely convey the difference between the two pieces of roast beef. Both are cooked to a core temperature of 55C/131F. The one on the left was cooked the traditional way in the oven, the one on the right was cooked sous-vide. What you can see is that the oven-cooked beef leaks a lot of juices, is well done near the edge and only truly medium-rare in the center, whereas the sous-vide cooked beef hardly leaks juices and is perfectly medium-rare from edge to edge. What you can’t see is that the sous-vide beef is so much more tender and therefore tastes so much better. The visible difference would have been more dramatic if I had used a larger roast, but as I had predicted the outcome I didn’t want to ‘ruin’ a larger piece of beef by cooking it in the oven. 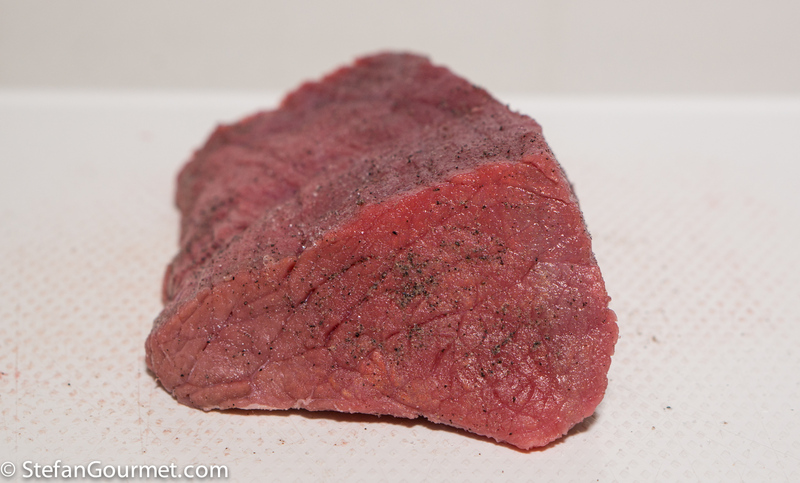 This is the piece of beef that I used for this experiment. 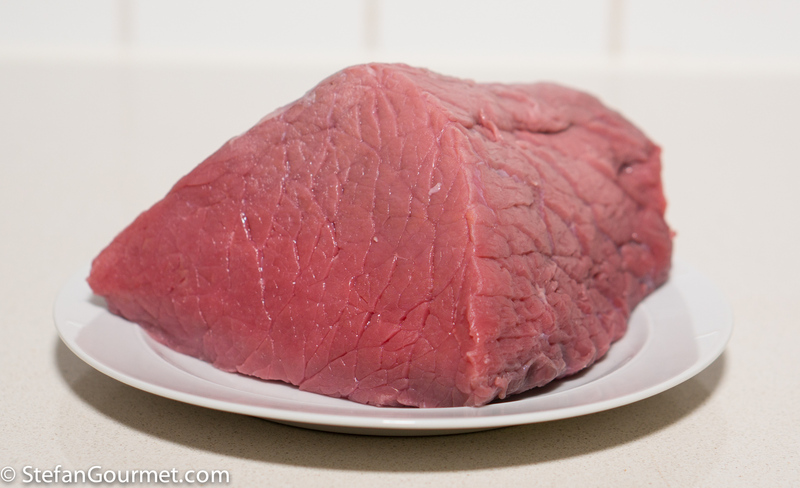 It is about 800 grams (1.8 lbs) from the rump or top round, and called “rosbief” in Dutch because it is suitable to make roast beef. In the Netherlands rosbief is served hot or cold and thinly sliced on a sandwich. I cut the roast into two pieces lengthwise for this experiment. The pieces were about the same size to make it a fair comparison. I seasoned each piece on all sides with salt and freshly ground black pepper. …until they were nicely browned on all sides. …and then covered it with plastic wrap and refrigerated it to cool completely. 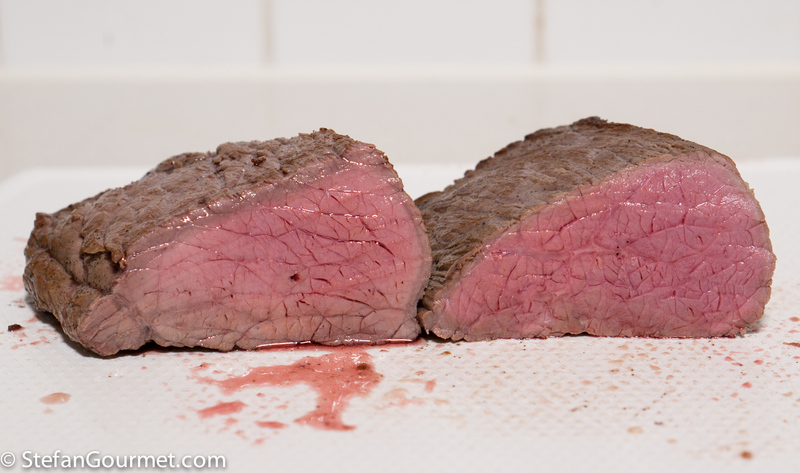 It is important to allow the beef to cool before vacuum sealing, as otherwise the vacuum sealing will bring the juices to a boil and draw a lot of them out (this is because at low pressure, the boiling point drops). 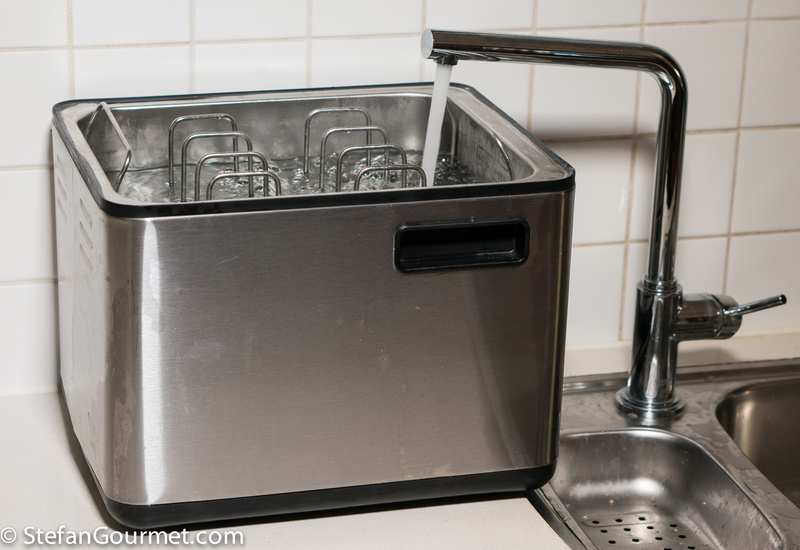 I filled up my sous-vide with hot tap water, because that saves time as compared to filling it with cold water. 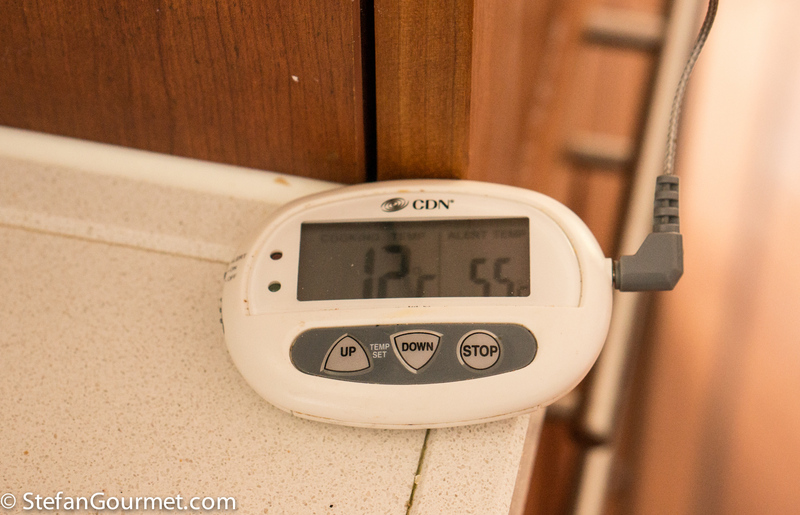 …so it would take less time to warm up to the cooking temperature of 55C/131F. 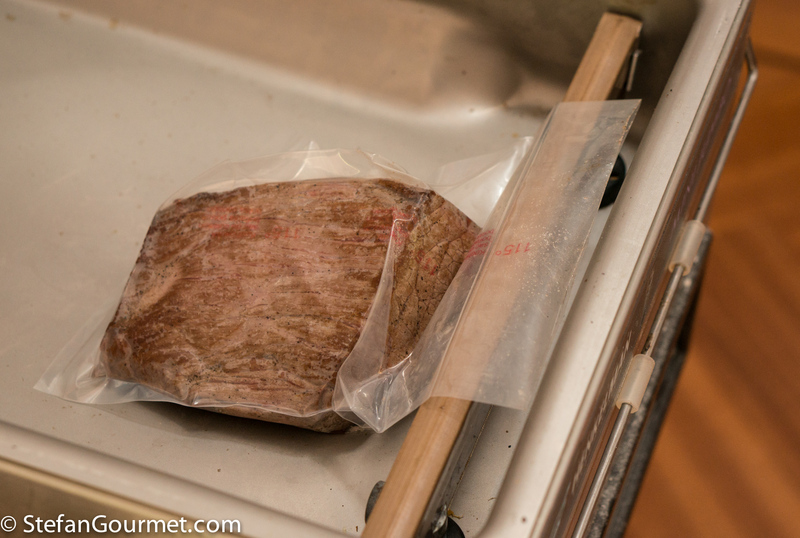 I use a chamber vacuum sealer to vacuum seal the beef, but you can also use a ‘clamp’ vacuum sealer or a ziplock bag and the water displacement method to vacuum seal. 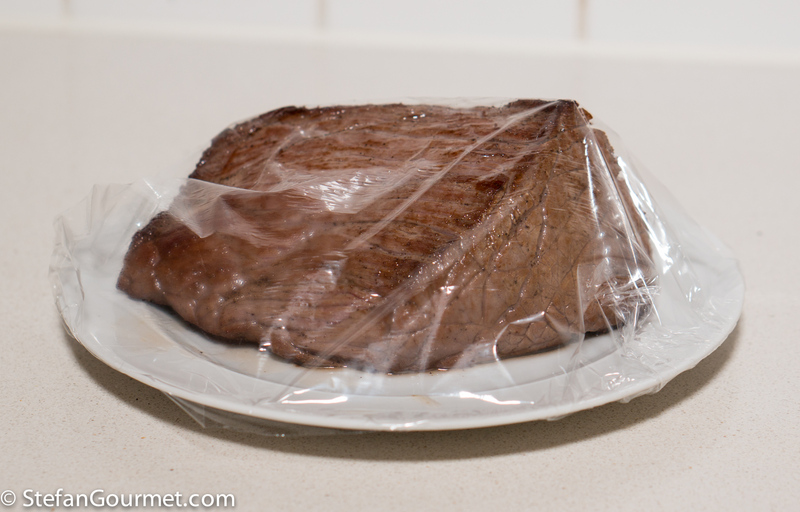 A true vacuum isn’t absolutely necessary, but there shouldn’t be large pockets of air in the bag as that will make the beef float or cook unevenly. 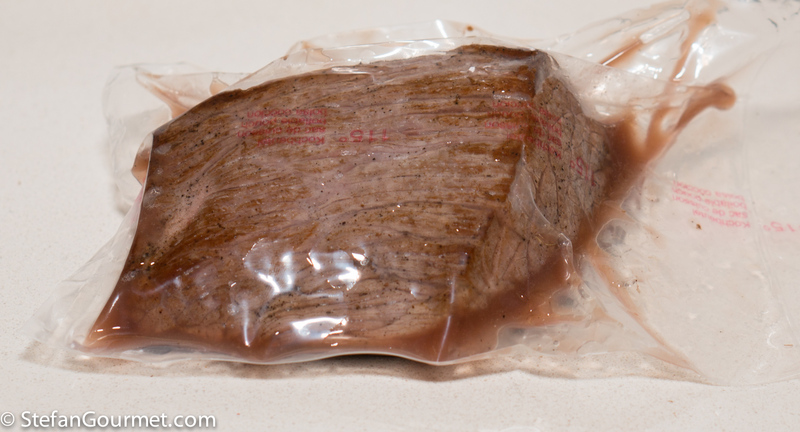 I put the vacuum sealed beef in the sous-vide once the water had reached the correct temperature of 55C/131F. 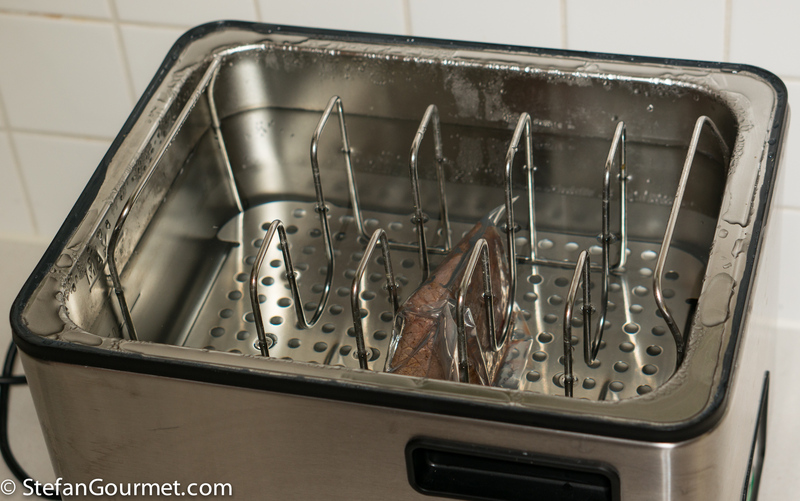 Then I put the lid on the sous-vide and allowed the beef to cook for about 2 hours. 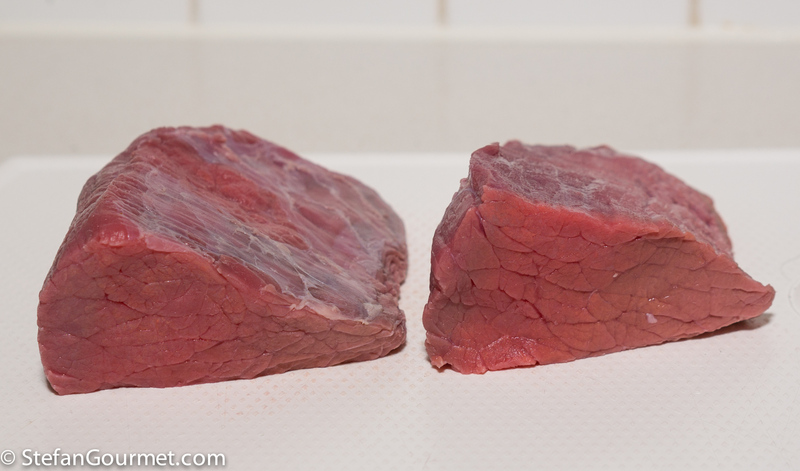 The cooking time depends on the thickness of the beef; in this case it was about 5 cm (2 inches) thick. One handy thing about sous-vide is that the cooking time is pretty flexible: if you leave it in longer, the beef will very very slowly become more tender, but you could easily leave it in for 6 hours. If you leave it in for 4.5 hours, a piece of beef of this size cooked at 55C/131F would even be pasteurized and so you can have the best of both worlds: medium rare without the (small) risk of eating beef that has not been pasteurized. To cook the beef in the oven, I inserted the probe of an instant-read thermometer into the center of the beef, and cooked it in the oven, which I had preheated to 180C/350F. As you can see the beef had a core temperature of only 12C/54F at this point. My instant-read thermometer has a very handy function in that you can set a target temperature (in this case 55C/131F) and it will beep when that temperature has been reached. 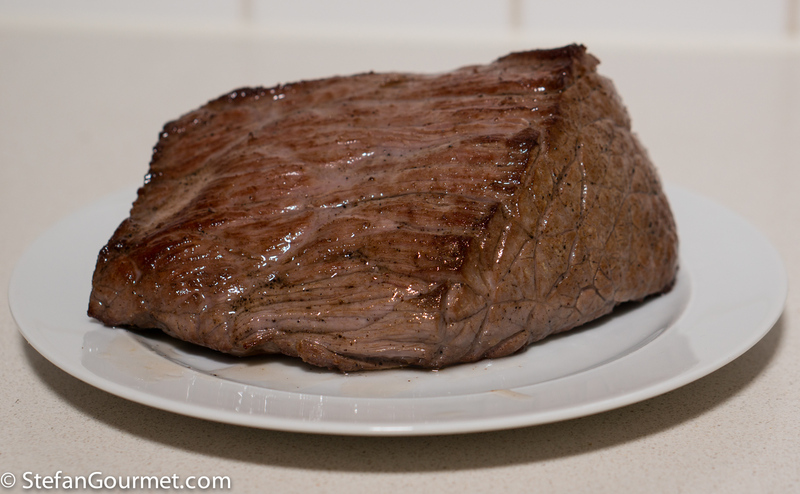 It took about half an hour for the core of the beef to reach 55C/131F in the oven at 180C/350F. 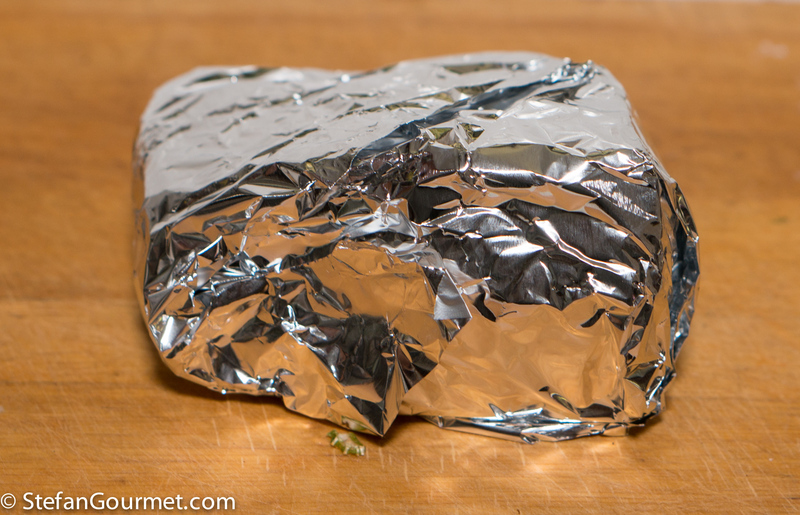 After the thermometer had beeped, I removed the beef and wrapped it in aluminum foil to rest. I timed it such that when the oven-cooked beef had rested the beef cooked sous-vide was also ready, so I took it out of the water bath. As you can see the beef had leaked some juices. I cut open the bag and in this case discarded the juices, as it was just a little and not enough to bother making a sauce. 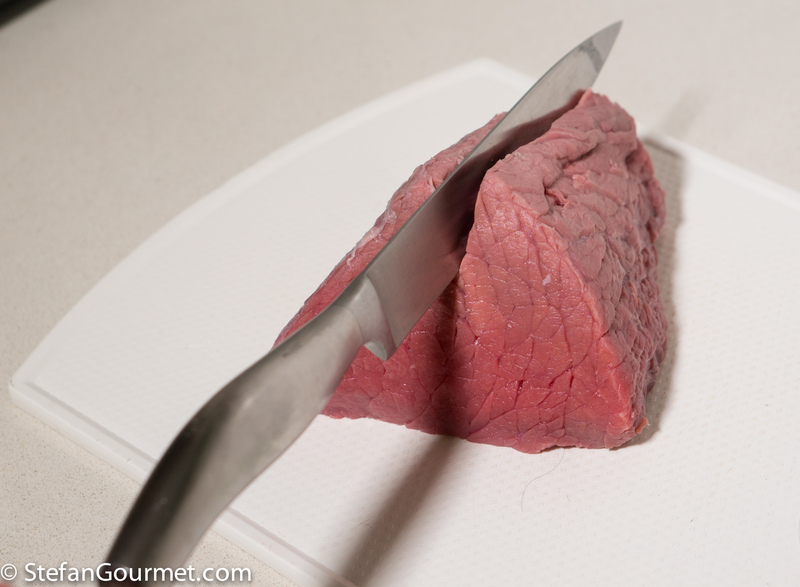 I sliced the beef across the grain. Even though I had allowed the oven-cooked beef to rest for 10 minutes, it still lost quite a bit of juices. As already mentioned in the introduction, the roast beef cooked sous-vide was much more tender and juicy than the oven-cooked beef. 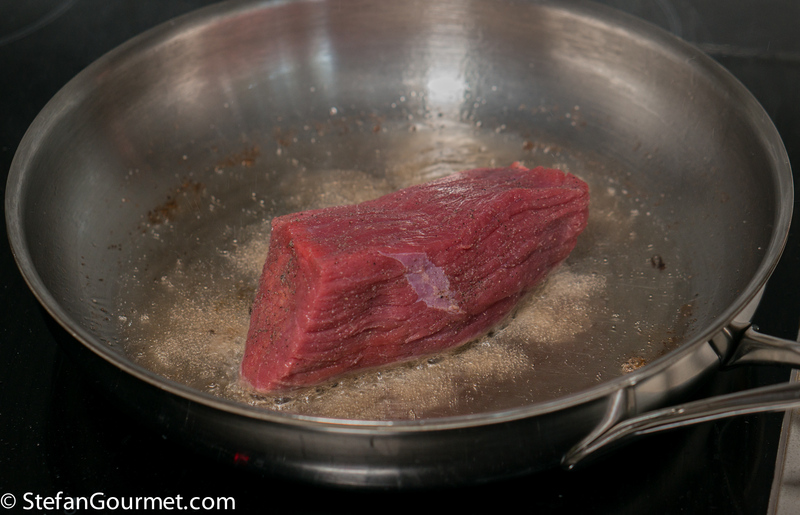 If you are already familiar with sous-vide cooking, you may be wondering why I chose to sear the beef before cooking it sous-vide. 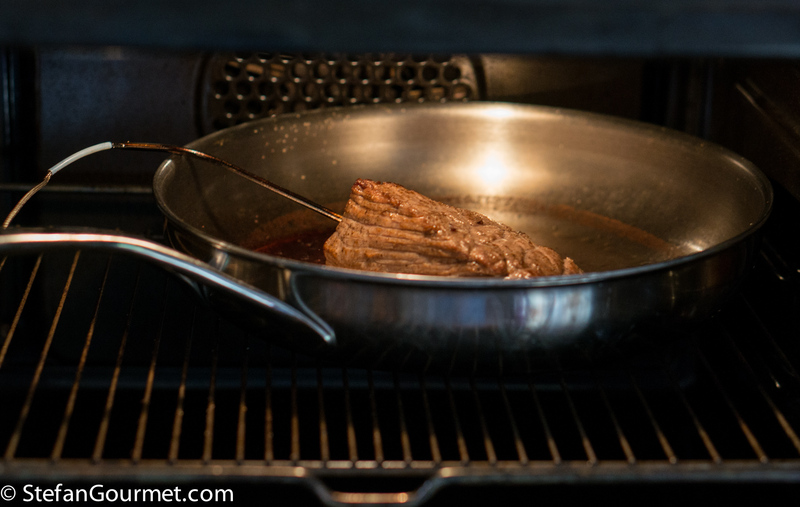 The drawback is that it takes a bit more time (as the beef has to cool after searing before it can be vacuum sealed), but the advantage is that there is no risk of overcooking the beef during the sear (which is a risk if you sear it after cooking sous-vide) and that there is no need to rest it before slicing. For a steak another drawback would be that the crust will lose its crispiness if you sear before cooking sous-vide, but with a roast like this that is not a concern. 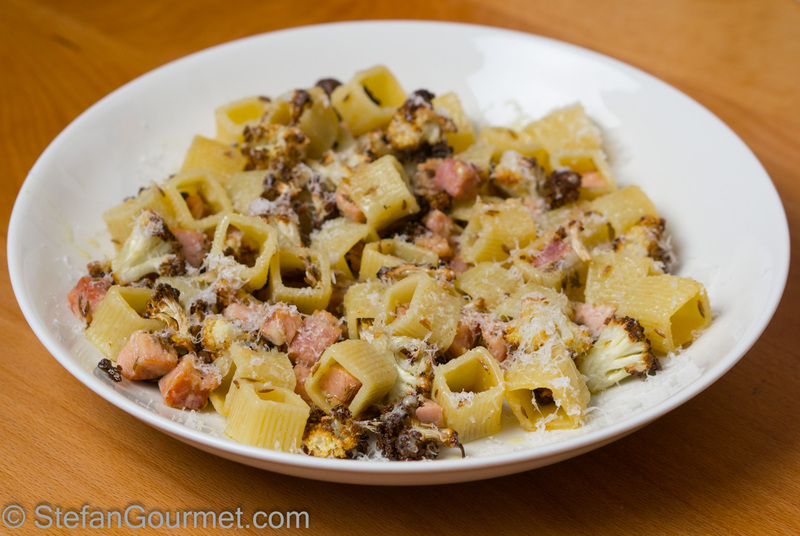 Pasta with roasted cauliflower, ham, and cumin is not a traditional Italian dish, but it sure is delicious. The differences are so obvious! 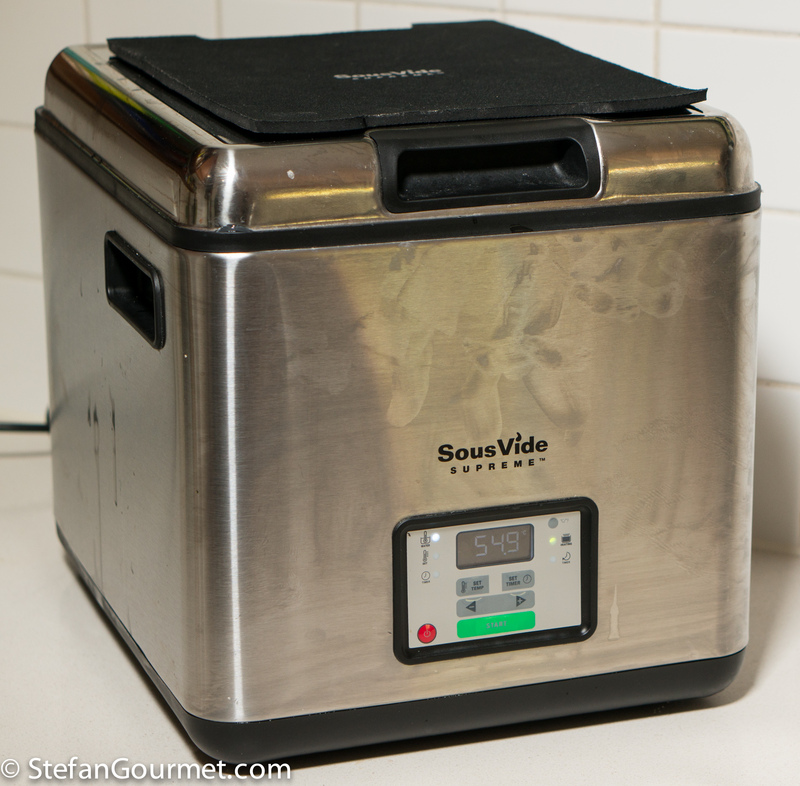 My husband, who was reluctant to buy me a sous vide for Christmas years ago (I even wrote a post about it), still rants and raves about the meat I sous vide. This week it was pork loin and flank beef steak. I use sous vide even more than I thought I would! Very well set out lesson for someone who is simply recalcitrant . . . . I’ll still put my rare roasts in the oven but enjoyed the lecture . . . 🙂 !! One question about the over-roasted meat – you are supposed to set the temperature to the 5F degrees less than the desired “doneness”, so if you put it to 131F, the resulting meat would reach about 135F-136F? I would assume it is different in case of sous-vide? You are right on both counts. With sous-vide there is no temperature gradient. I enjoy your articles, very much Stefan. 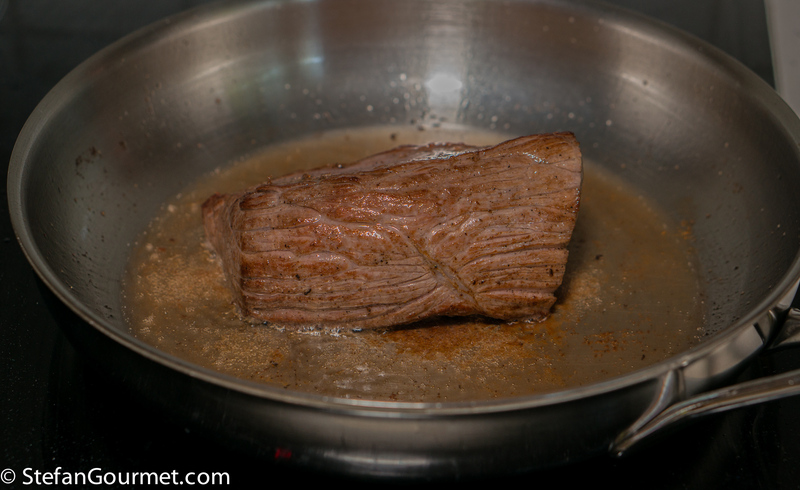 I have a sous-vide, but I prefer to slow cook a roast of beef in the oven at 225-250ºF until it reaches 130ºF. Then I let it rest. Just before serving, I put it back in a 500ºF oven for 5 minutes or so to brown it. It’s medium rare right to the edge. 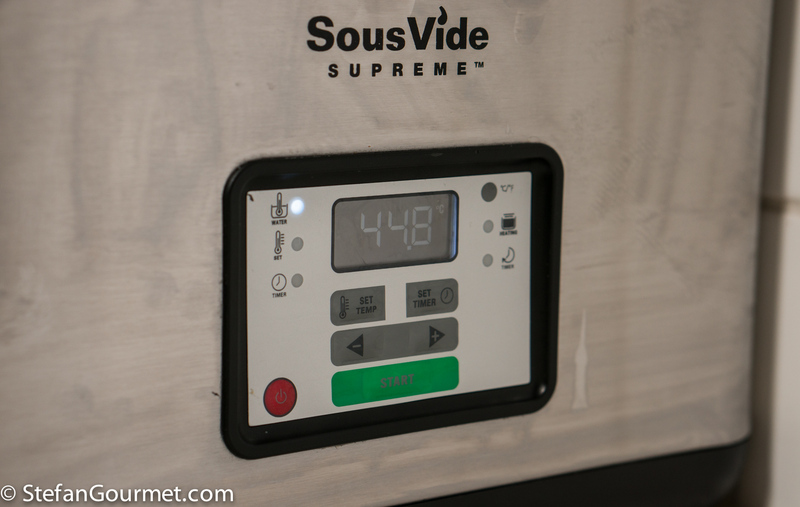 Have you ever cooked top loin sous vide for 18-24 hours? I just tried it on a particularly tough cut. Really tender and still med-rare. I’ll have to google the cut. What temperature did you use? I currently have a 4 pound, bone in, select grade beef ribeye roast in my Dacor oven set at 135 degrees F. It has been in the oven now for 13 hours. The internal beef temp is now 135 degrees F. My intention is to leave the roast in the oven for another 11 hours. I first set it in a 500 degree oven and then immediately turned temp down to 135 degrees (to brown the outside and kill any surface bacteria). At the end of roasting time I intend to take the meat out of oven, raise temp to 500 degrees and set roast back in oven for 5 min max to crisp up the outside. Then let it rest on counter for 20 minutes. Any comments, observations, advice? I would love to hear from someone! I would wrap the roast during the long cook to prevent it from drying out. 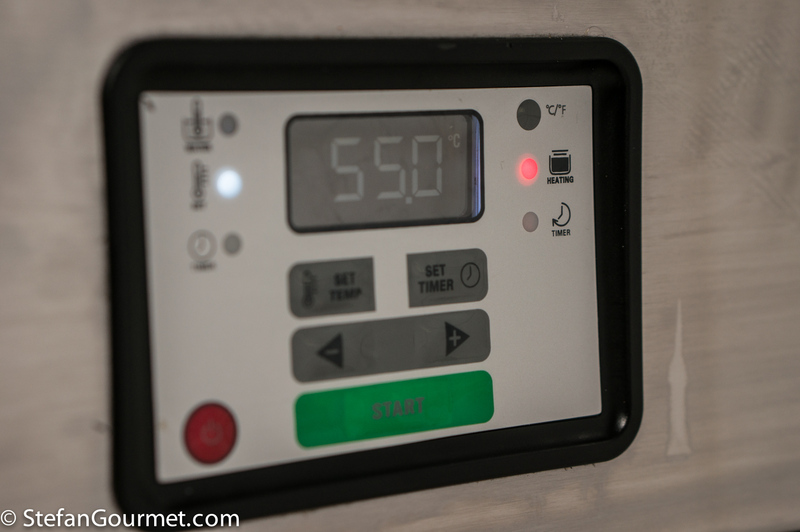 Or does the Davor oven allow you to set the humidity? Make sure the final Browning doesn’t overcook the roast. Above roast turned out amazing. What I didn’t mention was that I inserted some fat and salt mashed garlic using a barding needle. Also, at the end of roasting the crust was so good I did not return to a 500 degree oven for 5 minutes. I just let the roast set on counter for 1/2 hour. Amazing, considering the meat was SELECT grade. Also, not necessary to wrapping foil because meat is on a rack, high above a pain and 1 cup water is in the pan – not touching meat. I am currently trying this trick with a 3 lb triton. Somewhat surprised no one else has commented! I am not surprised the initial 500 degrees created a good crust. The water is a good hack to keep the humidity up.